30 years of Exhibition Experience. Natural Transition to an Online B2B Platform. Our Mission still remains to provide the best common platform for Buyers & Sellers of Gifts & Stationery. 5000+ Verified (Trust Seal) Buyers to start with New marketplace to showcase products. Giftex is one stop solutions for Corporate Gifting and Promotional Gifting. 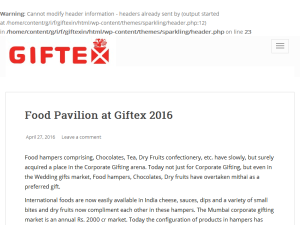 This what your Official Giftex Blog Blog Ad will look like to visitors! Of course you will want to use keywords and ad targeting to get the most out of your ad campaign! So purchase an ad space today before there all gone! Here is a guide to making the most out of promo product’s advantages. As our previous blog covered, one thing is clear that promotional products are an important part of the marketing mix. We have already discussed who are the people using promotional products and why are they using it. How Do Promotional Items Work? There are various reasons for which promotional products can be used for example to break the ice between clients and company, attract new ones, to strengthen the bond with your existing customers to motivate employees and many more. Promotional products don’t just bear your company’s name and logo but deliver the message that your company wants to put across. A study states that people receiving promotional products keep the product for a minimum up-to eight months depending on its utilitarian value. This proves that promotional products make a long-lasting impact in comparison with the traditional methods of marketing. At times, promotional products are given forward that increases the reach of your products than what you had aimed for. The lifespan of the promotional product in use depends on the type of product you are choosing and for whom. With a good quality utilitarian product, you can be assured that your promotional product will be used for a longer time than any other advertising method. Once the product is out of reach it will still carry the brand recognition with the company logo. In case the product is given forward, it will increase the brand reach making it more effective. There are variety of options that you can choose to be your promo product depending upon your need and budget. There is a promo product to fit each budget and purpose all you need to do is choose wisely. Promotional products stay for a longer span than any other marketing pertaining to its utilitarian purpose. Also, they are re-gifted in some cases. This brings us to the conclusion that promotional products reach a wider audience than any other advertising. Giving away promotional products as corporate gifts speaks about the goodwill of your company and thus strengthens the bond between company and clients. A research data shows that 52% of people given a promotional item ended up doing business with that company. Versatility is a major plus point of promotional products. Promotional products give freedom to explore creative ways to promote your brand through promotional products. From packaging to customization it gives an array of options to place your branding. Here are some benefits of using promotional products and how they can help make your brand memorable and trustworthy. Promo products increase the brand visibility and thus improve the outcome of marketing. A study says that adding promotional items. The same study concludes that despite people being bombarded with advertising messages, promotional products are effective in delivering their message accurate whilst being utilitarian. A specific survey has shown that over 76% of the survey respondents remember the promo products they received over the past two years and the branding. This shows that the pro products have a long lasting effect on receivers and that too in the same or lesser price as required for traditional marketing. If you are the owner of Official Giftex Blog, or someone who enjoys this blog why not upgrade it to a Featured Listing or Permanent Listing?